NO PURCHASE OR PAYMENT NECESSARY TO ENTER OR WIN. MAKING A PURCHASE OR PAYMENT WILL NOT INCREASE YOUR CHANCE OF WINNING. VOID WHERE PROHIBITED. THE FOLLOWING SWEEPSTAKES IS INTENDED FOR PLAY IN THE 50 UNITED STATES AND THE DISTRICT OF COLUMBIA AND SHALL BE CONSTRUED AND EVALUATED ACCORDING TO UNITED STATES LAW. DO NOT ENTER THIS SWEEPSTAKES IF YOU ARE NOT LOCATED IN THE UNITED STATES. WHO MAY ENTER: Open to all legal U.S. residents, age 18 and over. Individuals employed by 1Debit, Inc. d/b/a Chime (“Sponsor”) or The Bancorp Bank, their affiliated companies, subsidiaries, or advertising and promotion agencies (collectively “Sweepstakes Parties”) at any time during the Sweepstakes Period, and members of their immediate family (parent, child, sibling or spouse of any of the foregoing) or persons living in the same household (those living in the same household for at least 3 of 12 months preceding the Sweepstakes Period), are not eligible. HOW TO ENTER: Eligible entrants (“Entrants”) must have an Instagram account to enter this Sweepstakes but there is no requirement that the prospective Entrant be a Chime Member. See below for details. 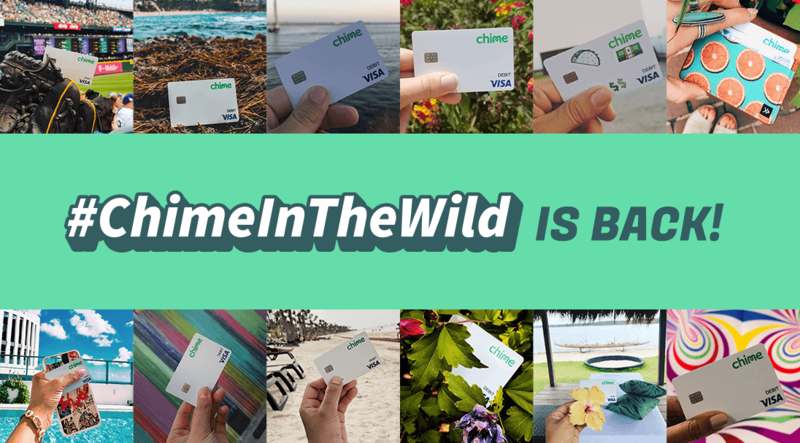 Entrants must visit www.instagram.com/chime (“Website”) during the Sweepstakes Period; follow @Chime on Instagram; post (1) one photo of any Chime Visa® Debit Card (“Chime card”) to their own personal Instagram account; tag @Chime in the photo; and include the hashtag #ChimeInTheWild in the photo caption (“Entry”). For security reasons, the photo must NOT show any part of the 16-digit Card number or the name of the Chime Member. The Entry will be rejected if any part of the Chime card number is detectable. In addition, no Entry may contain any offensive or vulgar content or depict any pornographic or illegal act. Any Entry containing inappropriate content, as determined by Sponsor in its sole and absolute discretion, will be considered ineligible and will not be part of the Sweepstakes. By submitting an Entry, each Entrant agrees his or her Entry complies with these Official Rules. Each Entrant also agrees that Sponsor may disqualify the Entrant from the Sweepstakes if Sponsor believes, in its sole and absolute discretion, that an Entry fails to comply with these Official Rules. If Sponsor rejects any Entry, such Entry will be disqualified and will not be considered a valid Entry. Subsequent attempts to enter may be made but only the first attempted entry received from an individual’s Instagram account will be eligible; subsequent attempts to enter will be disqualified. Entries may only be made according to the method described above. Note: Any Chime card can be in the photo. Automated entries (including but not limited to entries submitted using any robot, script, macro, or other automated service) are not permitted and will be disqualified. Only eligible Entries actually received by the Sponsor before the end of the Sweepstakes Period will be included in the prize drawing. Illegible, unintelligible, incomplete, or garbled Entries will be disqualified. Limit one Entry per person/Instagram account during the entire Sweepstakes Period. HOW TO WIN: On May 1, 2019, Sponsor will randomly select ten (10) potential winners from among all eligible Entries received during the Sweepstakes Period. Potential winners must meet the eligibility requirements set forth in these Official Rules in order to qualify for a prize. Limit one prize per person. Note: You are not a winner of any prize until you have been verified as a winner by the Sponsor. ODDS OF WINNING: The odds of winning depend upon the number of eligible Entries received during the Sweepstakes Period. PRIZES: Ten (10) winners will each receive the following prize: If a Chime Member, i.e., a customer with an open Chime Spending Account, each such winner will receive one (1) $1,000.00 one-time deposit to the Chime Spending Account; if not a Chime Member, each such winner will receive one (1) $1,000.00 Amazon.com virtual gift card. The total ARV (Approximate Retail Value) of all available prizes in the Sweepstakes is $10,000.00. Only prizes specified in the amounts indicated will be awarded. Prizes are non-transferable, with no cash redemption or equivalent. Sponsor reserves the right to substitute a prize or prize component of equal or greater value should a prize or any component of a prize become unavailable. Except as specifically provided herein, all applicable taxes and usage charges on prizes are the sole responsibility of the winner. If required by law, Sponsor or its agents shall require payment from winner of taxes to be remitted to the appropriate taxing authorities. Sponsor expressly disclaims any responsibility or liability for injury or loss to any person or property relating to the delivery and/or subsequent use of prizes awarded. Sponsor makes no representation or warranties concerning the appearance, safety or performance of any prize awarded. CLAIMING PRIZE: On May 1, 2019, each potential winner will be notified by a direct Instagram message from @Chime. Each potential winner has twenty-four (24) hours from the time the direct message is sent to send a reply direct message to @Chime. Potential winners may be asked to verify eligibility. Failure to respond within twenty-four (24) hours of potential winner notification may result in disqualification and an alternate potential winner may be selected. If a potential winner is found to be ineligible; is not in compliance with these Official Rules; declines to accept the prize; does not comply with Sponsor’s instructions; or the prize is returned as undeliverable, the prize may be forfeited in Sponsor’s sole discretion. If a prize is forfeited, then the prize may be awarded to an alternate winner, selected in a random drawing from among all remaining eligible Entries received, as determined by Sponsor in its sole discretion. Sponsor shall not be held responsible for any delays in awarding the prize for any reason. Each prize will only be awarded to a verified winner. Any unclaimed prizes will be awarded in a random drawing to be held as necessary. By accepting a prize, each Entrant consents to Sponsor’s use of their name, photograph and/or likeness, address, voice, and statements made by or attributed to them, in perpetuity, in any and all media now known or hereafter developed (including, without limitation, print, broadcast and Internet), for all legitimate business purposes including advertising and promotional activities without additional compensation, unless prohibited by law. Upon deposit of the prize to the winner’s Chime Spending Account or delivery of the prize to the non-Chime Member’s email address, Sponsor will be deemed to have awarded the prize to the winner with winner assuming full responsibility for the prize. MISCELLANEOUS CONDITIONS: All entries become the property of Sponsor and will not be returned. By participating, Entrants agree to abide by and be bound by these Official Rules, which shall be final and binding with respect to all issues relating to this Sweepstakes. It is the Entrant’s responsibility to ensure compliance with all of the conditions contained in these Official Rules. Sponsor is not responsible for any lost, late, misdirected, stolen, illegible, incomplete Entries, or for any computer, online, telephone or technical malfunctions that may occur. Sweepstakes Parties are not responsible for any incorrect or inaccurate information, whether caused by Website users, any of the equipment or programming associated with or utilized in the Sweepstakes, or any technical or human error which may occur in the processing of submissions in the Sweepstakes. Sweepstakes Parties assume no responsibility for any error, omission, interruption, deletion, defect, delay in operation or transmission, communications line failure, theft or destruction or unauthorized access to, or alteration of, entries. Sweepstakes Parties are not responsible for any problems, failures or technical malfunction of any telephone network or lines, computer online systems, servers, providers, computer equipment, software, email, players or browsers, on account of technical problems or traffic congestion on the Internet, at any website, or on account of any combination of the foregoing. Sweepstakes Parties are not responsible for any injury or damage to participants or to any computer related to or resulting from participating or downloading materials in this Sweepstakes. If, for any reason, the Sweepstakes is not capable of running as planned, including infection by computer virus, bugs, tampering, unauthorized intervention, fraud, technical failures, or any other causes beyond the control of the Sweepstakes Parties which corrupt or affect the administration, security, fairness, integrity or proper conduct of this Sweepstakes, Sponsor reserves the right at its sole discretion to cancel, terminate, modify or suspend the Sweepstakes and select winners from among all eligible entries received prior to the cancellation. Persons found tampering with or abusing any aspect of this Sweepstakes, or whom Sponsor believes to be causing malfunction, error, disruption or damage will be disqualified. CAUTION: ANY ATTEMPT BY AN ENTRANT OR ANY OTHER INDIVIDUAL TO DELIBERATELY DAMAGE ANY WEBSITE OR UNDERMINE THE LEGITIMATE OPERATION OF THE SWEEPSTAKES MAY BE A VIOLATION OF CRIMINAL AND CIVIL LAWS. SHOULD SUCH AN ATTEMPT BE MADE, SPONSOR RESERVES THE RIGHT TO SEEK DAMAGES FROM ANY SUCH PERSON TO THE FULLEST EXTENT PERMITTED BY LAW. Sponsor reserves the right to correct any typographical, printing, computer programming or operator errors. By participating in this Sweepstakes, each Entrant agrees to release and hold harmless Sweepstakes Parties and each of their respective parent companies, affiliates, subsidiaries, officers, directors, representatives, agents and employees, from any and all liability whatsoever for any injuries, losses or damages of any kind arising from or in connection with, either directly or indirectly from: 1) the awarding, acceptance, receipt, possession, use and/or misuse of any prize awarded herein; or 2) participation in the Sweepstakes or any prize related activities. Arbitration and Choice of Law: Except where prohibited by law, as a condition of participating in this Sweepstakes, Entrant agrees that (1) any and all disputes and causes of action arising out of or connected with this Sweepstakes, or any prizes awarded, shall be resolved individually, without resort to any form of class action, and exclusively by final and binding arbitration under the rules of the American Arbitration Association (AAA) and held at the AAA regional office nearest the Entrant’s residence; (2) the Federal Arbitration Act shall govern the interpretation, enforcement and all proceedings at such arbitration; and (3) judgment upon such arbitration award may be entered in any court having jurisdiction. Under no circumstances will Entrant be permitted to obtain awards for, and Entrant hereby waives all rights to claim, punitive, incidental or consequential damages, or any other damages, including attorneys’ fees, other than Entrant’s actual out-of-pocket expenses (i.e., costs associated with entering this Sweepstakes), and Entrant further waives all rights to have damages multiplied or increased. All issues and questions concerning the construction, validity, interpretation and enforceability of these Official Rules, or the rights and obligations of Entrants and Sponsor in connection with this Sweepstakes, shall be governed by, and construed in accordance with, the substantive laws of the State of California, USA without regard to California’s choice of law rules. Official Rules: If you would like a copy of these Official Rules, please send a self-addressed stamped envelope to: Chime #ChimeInTheWild Giveaway List, Chime, PO Box 417, San Francisco CA 94104. Vermont residents may omit the return postage. Requests received after the close of the Sweepstakes Period will not be honored. IDebit, Inc. d/b/a Chime, PO Box 417, San Francisco CA 94104. Instagram® is a registered trademark of Facebook, Inc. All rights are reserved. Amazon® is a registered trademark of Amazon.com Inc. All rights are reserved.